We know sea levels are rising. We can even project how the rising ocean will change our cities. But seeing how drastically our world will be changed, thousands of years in the future? That's something else. The designer and cartographer behind the blog Spatialities, Jeffrey Linn, is finding out what that distant future looks like. And he's naming it, too: The Los Angeles of the future includes the "Sea of O.C. "; New York has the "Isle of Jersey." 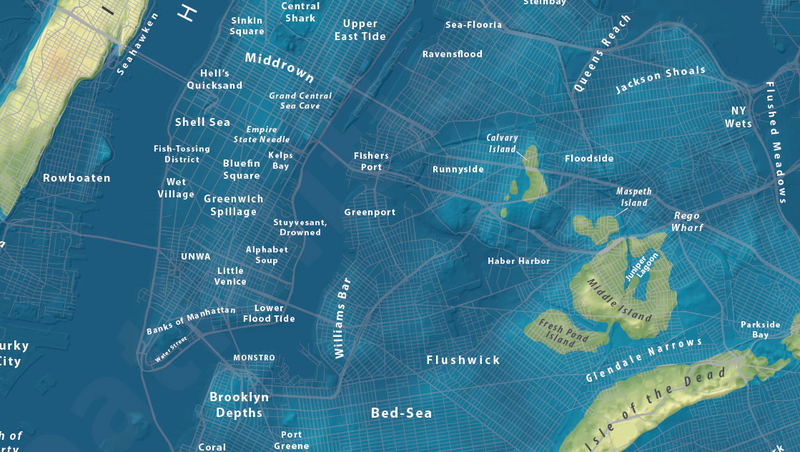 Linn uses public data to create maps that show what major cities look like in a world of extreme sea level rise, which the US Geological Survey says is about 80 meters, or 262 feet. "The maps that show what will happen within our children's or grandchildren's lifetimes is fairly well-worn territory," he says over email. "What I haven't seen much of are maps that take it to the end point of what is possible in a thousand or more years." Except for Burrito Justice's 2012 map of the so-called San Francisco archipelago, those distant projections didn't really exist. "I wanted to make something that hasn't been seen before, and is beautiful, detailed, and extreme," says Linn. Using publicly available sources on both sea level rise and urban elevation data, he is extrapolating what we know about the changing oceans into a vision of the future that's both unbelievable and very realistic. For example, he takes care to label each map with new place-names that are sensitive to the city's culture and current geography. In New York, most of what remains of Manhattan is split up into islands named for the cultural institutions they rest on: CUNY Island, Carnegie Island, and Columbia Island. LA, meanwhile, has the Sea of O.C. and LAX has become Ex-LAX, of course. Linn even invites suggestions for naming these speculative landmasses—his map of of the Montreal Archipelago, for example, has mostly French names, for which he invites new suggestions ("I gave names to some of the larger islands, but I don't know it well enough to do it justice," he writes). Linn doesn't have a single motive for creating these half-fictional cities of the distant future—they are both fun experiments and depressing demonstrations of what could very well be coming to pass in slow-motion around us. "The real damage from climate change will happen well before any of these scenarios come to pass," he says, "but if these maps help create awareness of how humans are accelerating it, then I consider that an added bonus to a fun, fascinating project." You can buy versions of the maps for hanging here, or browse them all on Linn's site right here.